with Businessweek. Considering the fact that he shies away from media attention, unlike Steve Jobs, this interview offered us a rare glimpse of the life, as the CEO of Apple. Let me just share with you all, 1 main take away from this article. And that is you can only do a few things great. Apple is the world’s second-largest information technology company by revenue after Samsung Electronics, and the world’s third-largest mobile phone maker after Samsung and Nokia. And you might be surprised to know how few products the company actually creates. 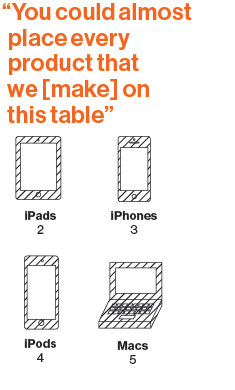 You could almost place every product that we [make] on this table. “I mean, if you really look at it, we have four iPods. We have two main iPhones. We have two iPads, and we have a few Macs. That’s it,” he says. It’s not to say that you can’t dream. However ideas are virtually useless if you don’t act on anyone of them. And as leaders, we must always focus on our goals, and more importantly our plan of action. Paul Meyer talks about, “developing a dogged determination to follow through on your plan”. So, for you to be successful, what are the things that you can do, and simply focus on? ← The Award . . .